The politeness. People in the street say “Bonjour!”, whenever you sit down to eat strangers wish you “Bon Appetit”, you get greeted when you enter a shop and they bid you farewell when you leave, groups of teenage lads shake hands when they meet each other. It’s all rather nice. The sun. I am not used to living in factor 10 (upgrading to 20 when I’m out for a bit), and it’s having a detrimental effect on the complexion. I had to buy some clearasil the other day, it’s like being 14 again!!! The keyboard layouts. At work I have a French keyboard, and at home an English one, so I’m stuck between two layouts. I’m now at the stage where I am making mistakes in both. Being 900 miles away from Rog, still. 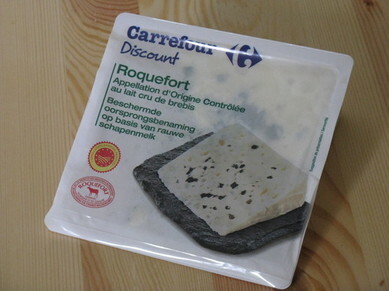 Is the roquefort any good? Yeah, the roquefort is really rather nice. I thought it had to be tried, and I can see myself getting it again.